Dallas has gotten lucky this week – the weather has been just beautiful! Cool, crisp mornings and mild sunny afternoons. With that in mind, I like to layer. I always get chilly in restaurants (or even when it’s just 70 degrees with a slight breeze), so I tend to throw a blazer on over my outfit to keep myself comfortable. This flirty OTTE piece is supposed to be a dress, but I’ve styled it as a top (it’s a little to short for me to be worn otherwise). It’s going to be an amazing layering piece when it gets even cooler – can’t wait to wear it with my leather leggings (these are on sale)! While it’s still warm, it looks great over leather shorts for a night out. Clearly I’m into animal prints for fall – definitely a new neutral! Love this outfit, the top is so pretty it is perfect paired with the structured jacket. 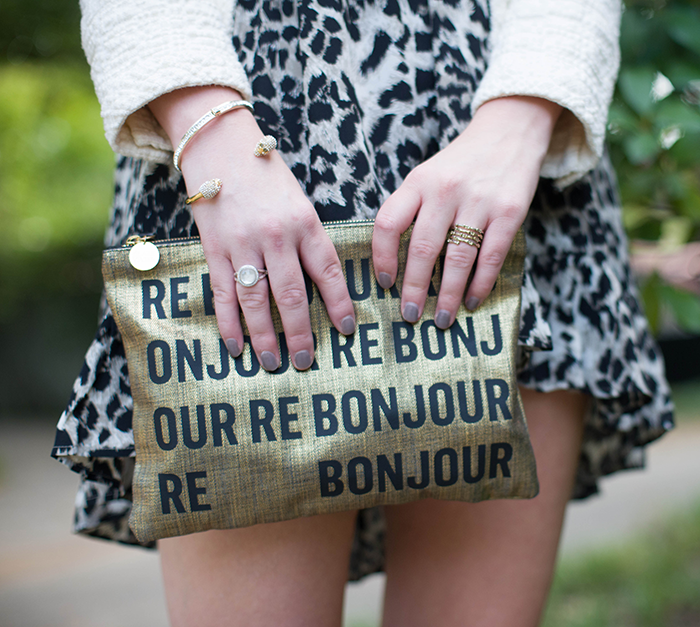 LOVE this combination – that clutch is so fun and the textured jacket really elevates the whole look! ur styling is perfect ! This is a cute outfit for the current weather. Love your style! Love animal prints! Love love this! That dress/top is so cute. And I really love the jacket. You look fabulous! Such a great combo! Love that jacket and the dress is so fun!! the dress/top is so cute! And I love how you styled it with the jacket. Super cute. I’m loving the grayish nail polish for fall too! Love the super chic layers you put together!!! love the jacket and necklace, great combination! Stunning! 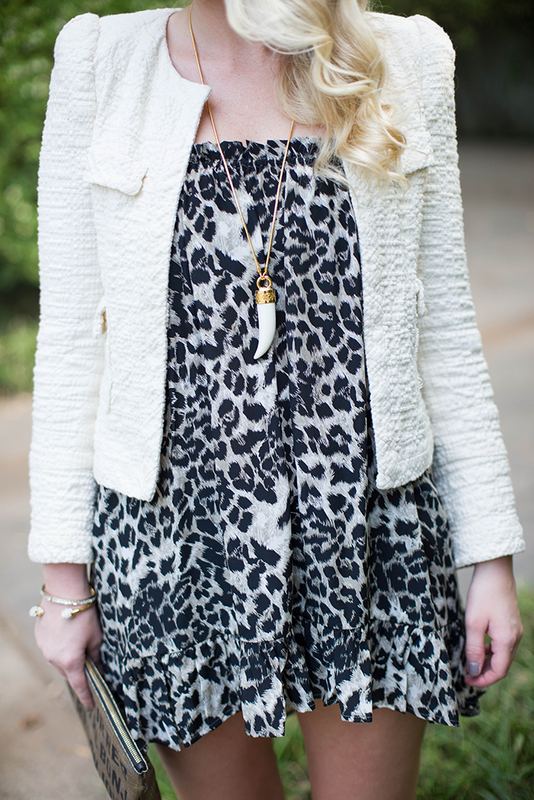 I love the ladylike jacket with the flirty white leopard print.